The BMW E46 navigation can fit: BMW 316i, 318i, 318Ci, 320i, 323i, 325i, 325xi, 328i, 330i, 330xi, M3, 318d, 320d, 330d, 330xd, etc. Discount still available! This BMW E46 navigation system is with 20% OFF now(Only $456), DON'T MISS OUT! Besides, Buy 10 units of BMW E46 Navigation Get One for Free! The bmw car radio e46 can fit BMW 3 series from year 1998 to 2004, including BMW M3, the BMW E46 was released in 1998, while 2002 is the best selling year for E46. * Windows CE 6.0 system. SiRF Prima, CPU: ARM 11 800MHZ + GRF3i, bluetooth chip BC3, DVD use Sunplus SPHE8202T decode chip. By default, the BMW E46 Navigation is with both short 17 pins(round) and 40 pins(flat) power connectors in the package. 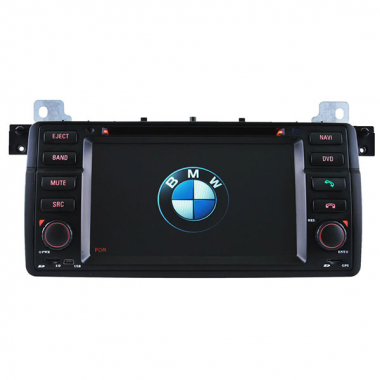 This bmw e46 dvd is easy for installation, because it's plug and play, besides, it has CAN BUS decode so your original steering wheel controls can still work after installing this bmw e46 gps navi. Car audio for BMW E46 comes with One Year Warranty! We've been selling this BMW E46 DVD since 2009, has got good feedback from lots of customers, we can guarantee this BMW E46 navigation dvd is the latest version for software and firmware direct from factory! 2. Built in GPS--19 lanugages:English, German, French, Spanish, Dutch, Hungarian, Czech, Danish, Norwegian, Swedish, Portuguese, Italian, Finland, Roumania, Greek, Russian, Poland, Turkey, Iran. 3. GPS dual zone function, can listen to music when GPS navigation is working. 4. Navigation PCB:COM2,Baud Rate:9600bps,The path of storageing SD Cards map:Storagecard*.exe;The path of storageing NandFlashs map :NandFlash*.exe. Note: We've found that there's a BMW E46 DVD Player in the market which has a buzzing sound at low volume, our BMW E46 DVD is with better quality and don't has such problem. The listed price is only for one unit, if you order more units you can feel free to contact us for better wholesale prices. Should you have any questions, please don't hesitate to contact us. For any inquiries, you will get a fast response within 12 hours. You don't need a relocation kit for air conditioning system, below is a picture of after installation of this BMW E46 navigation system. NOTE: If your BMW E46 has a 7 inch screen in the dash and harman kardon amplifier, our unit can support your harman kardon amplifier with 98% possibilities according to our experiences before. In case our e46 navigtion does not support your harman kardon amplifier, you can use our built-in 4x45w amplifier. I have a 2003 325i I was wondering if this unit will work on my car, it has the Ac controls on top if I buy this, will I be able to relocate the AC controllers down and install this unit >> Yes, it can fit your car, you can relocate the AC controls down to install this BMW E46 DVD/navigation unit. Just received my E46 DVD/Navigation Radio in the mail today. Was sent on time as promised. Installed it in about 30 minutes with no problems at all. Works great, and I am more than pleased with the outcome. It even made my speakers sound better than with my factory radio. Great product. I'm extremely happy with the device. The most valuable experience was the customer service. Joyce attended emails quickly and promptly. I really can't rightfully explain how wonderful the customer service was. Anything I would say would be an understatement. Thank you Joyce. Hello. Are maps for Cyprus available? And do the steering wheel buttons work with this system? Thanks. >> Yes, we have maps for Cyprus available, and this BMW E46 navigation dvd can support steering wheel controls as there's a can-bus decorder inlcuded in the package to support steering wheel control. For now the head unit works good and I am happy with it. I am just happy sound is good, GPS, SD, USB, and IPOD all work, the touch screen is also working. I have 2002 e46 coupe with navigation , will this fit my vehicle? >> Yes, this BMW e46 navigation unit can also fit your car of 2002 e46 with factory navigation. The exsisting nav/radio head unit for my 2002 318i e46 is play up so I wish to replace it, luckily i finally found this unit, i have to say this is one of the best units I've seen in a while! interface is brilliant, especially in the evening for the cool back light, good colors, not the cheap looking side by side menu's for usb or sd cards, but proper screens with all info.it's amazing! Looking to purchase for my 2004 325ci, wondering if this fits? >> Yes, it fits your car of 2004 325ci. I intalled it in my BMW 325i a couple of days ago, so far it works perfect.Thank you very much for all the help, you have a very good atittude towards the client. I will recomend you to all my friends. Does the GPS have spoken turn-by-turn directions. I am just wondering before I purchase. Also, is the microphone built in for Bluetooth? >> This function for GPS has something to do with the GPS maps, our free gift of IGO map has such function of turn-by-turn directions. The microphone is built-in the unit for bluetooth. Should you have any other questions, just feel free to contact us by sending an email to sales@cars-electronics.com, thanks. I was looking to replace my defective factory radio, read a lot of reviews, finally settled on this one. I was not disappointed! this is a good radio dvd gps ipod handfree, fit perfectly into my 2003 BMW M3 E46 Convertible, it's been 2 months since I installed it but it's still like the first day and works well. hi,, I wanna ask if the package contains a Microphone, for Bluetooth,, and can I make phone calls as I pair my phone via Bluetooth??? >> Yes, this BMW E46 DVD comes with a built-in microphone for bluetooth, and you can make and answer phone calls after pairing via Bluetooth. Installed in my 2003 BMW 330i in about 30min witch was easy. Every feature works like a charm, I love it! Works perfect,the touch screen is good quality and the sound is clear. Bluetooth was a must for me, no more phone tickets now, all in all, I'm very satisfied with it. Hi! I have a bmw 325i 2006 and want to make sure if e46 fit with my car. I will like to buy one, but want to make sure first. Thanks >> Hi, as long as your car is BMW E46, this unit can fit your car. For any other questions, just feel free to contact us. A very good e46 navigation unit, I installed it in my 02 323i, it came so fast and comes with all the stuffs in the package, looks so cool especially in the evening with the red buttons light. I'd like to recommend it 100%, installation is very easy. Can you ship to Bangkok, Thailand?Can it work with radio frequency in Thai? Can you give GPS map in Thai? Can i install and setting it to use with steering wheel control by myself? Thank you >> Yes, we can ship to Thailand and send you GPS maps for Thai for free as a gift, e46 navigation can work with radio frequency in Thai.There's a can-bus decode to support steering wheel controls, so you don't need to set steering wheel control after installation of this bmw e46 navigatioin. hi will work radio and nav sistem in Ireland area?plus how much will cost to get in Ireland ?tnx for advice >> Yes, the radio and nav system can work in Ireland area, you can check the shipping cost after you add it to the cart on the shopping cart page.